………and again lol. I am wearing the Bia Corsetted Dress from Baiastice available at C88. In my last post I wore the full version, but I couldn’t walk away from wearing the Pink short version. Analog Dog has some very pretty new releases out, Phaedra is a wonderful style with flexi bits in all the right places. I am hanging out in my beautiful little Garden Atelier tonight with some of my favorite pieces. Ola, a quickie to show you how much I adore thee newest Aeryn skin from [PXl] Creations available at We ❤ Roleplay. Ola! Oh my goodness I am blogging yay! I will wrap this up shortly so I can edit a few more posts and get them out today. ISON has this fabulous little mesh Slip Dress and Thigh High Hoove Boots out for this round of Collabor88 in multiple colors. I threw on a pretty Summer Long Vest (also ISON) that I had bought earlier, this you will find in the main store. Entwined is a spectacular new Hair store on the grid and the mesh Elizabeth hair screams ‘I want more!’ yes?! I looked forward to lot’s of pretty styles to come from Entwined! Glam Affair is everywhere, Sia is also available at C88 along with the Yummy Jack’s Typewriter Ring. Head over to FaMESHed for the beautiful Elegant Queen Pearl Stone Jewels from Zenith. Well it is simply fitting that I have a few posts out today since it is my 7th rez day, I will be back with some more goodness in just a few, until then shop til you drop and have an amazing Saturday! Good Morning! Paying my homage to one of my favorite 80’s bands this am, Warrant. Showing my age yes, but the 80’s were an important time in my life, coming into my own at this time, life was exciting and new and all around was the sexiest music you could hear. The long drawled out ballads of my youth still make me smile today when I hear them, and remember a time when life was much simpler than it is as we grow up and deal with everything that is thrown at us in our later years. Baiastice has this phenomenal mesh Sophia Jumpsuit out at this months round of FaMESHed and each color comes with a hud to change up the belt to match all your favorite accessories and shoes. I also nabbed this pretty Earth Stone Butterfly Necklace and Ring Combo from Zenith to go with. This outfit just screams spring/summer to me as in rl I am still dealing with snow, hail and rain. Got to love sl for being able to drag myself out of the winter funk earlier than I can. I took in the Timeline sim and so very pretty I stayed and walked around for some time, losing myself in the beautiful landscape and if there is a heaven, I know that this would be much like that, at least in my dreams anyway. Hai! It’s been a rough week here in my tiny house, paying full attention to rl is really a drag when I can’t sneak away to sl and blog all my pretty things! But I’m since I am here for today I am working away like crazy trying to get everything out in a timely manner……haha me and timely manner in the same sentance…….good lawd that is just laughable. Today I am wearing a few beautiful items from My Attic at the Deck, Emotions has this extremely fabulous mesh Nami Style out and oh how I love these wavy locks. Lacuna has a wonderful mesh Tetroz Tank and Maxi Skirt Set out, in every amazing color, the skirts come in a basic solid color or a base tri-color…..just yummy and perfect for the season! 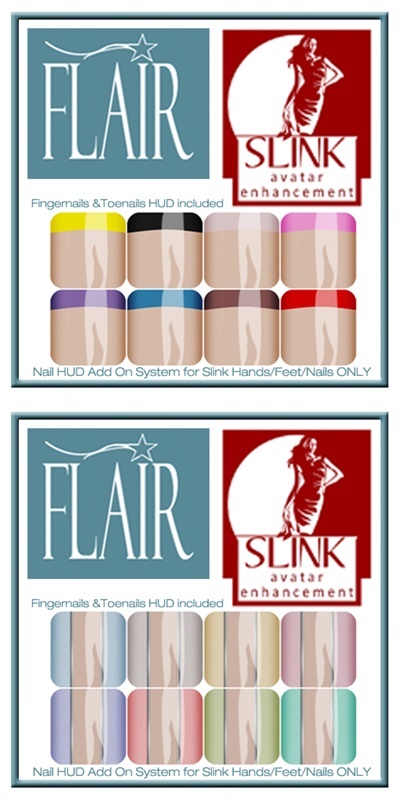 Miss Sasy from Flair has four new sets of Mani’s and Pedi’s out, these are a two for one, both packs of cuteness! I just adore the new mesh Bow Wedges from SYSY’s…….you need to wear your SLink Mesh AvEnhance Feet for these, and they come in the most amazing color choices. My Attic at the Deck is open until the end of the month, so only a few more days to snap up all the wonderfulness at 95L or less! Location: Santa Maria Island, Isla Okiddo featuring ‘Expodome?! Ola! Two posts in one day is just how I roll lol! A Beautiful Mess is one of my favorite songs and it is exactly how I feel today, Evion is always beautiful and of course her typist is always a mess……..ok maybe her inventory is messy too ha. Having some time off has given me a few moments of clarity here and there, in-between the good meds of course. I think I am going to ease on back to my dear second life and just enjoy what I do, as I have missed logging in and just playing. I do not do this often enough I find and I miss this aspect. I love blogging, in fact I may not still be here had I not started over three years ago…….as all I did was play before that. But then you get serious about something like photography and blogging and I think we lose some of the playfulness along the way, well in my case anyway. I really just wanted to grab my laptop and tp down to my little slice of land and decorate for the upcoming season……yes I tried but I fell asleep a few times and got nothing done, but in the back of my mind my thoughts were ‘Blog Evion’ and ‘You are NOT getting anything done this way’…….I wonder where I lost that ability to come into sl guilt free and start chatting with friends and hopping all over the place and really not accomplishing too much but fun. Hmmm the very reason I started sl in the first place. Oh do not get me wrong, I will still be blogging up a storm as it has become one of my passions, but I think I will be divvying up my time better. Time to have fun and stop the worrying. As one of my very favorite friends told me before I left ‘You do not owe anyone an explanation why you aren’t blogging’ and I thought about this many times in the past few weeks, moments of clarity, very few and far between and then I follow it up with a terrible cliché, but wise none-the-less. Besides maybe I will hold off a few days before prettying up my yard, as I know on the 15th the all new Liaison Collaborative will be opening and I know there is going to be some amazing Furniture, Poses and of course Pretty Clothes and Jewels and Accessories to be had! I cannot wait, and a big thank you goes out to Harvest for allowing me to be apart of these amazing event’s, You have Poser Pavilion, The Boutique and of course The Garden to look forward to. I have linked to the The Liaison Collaborative blog over in my events column and I will have the slurls there as soon as they open! But for now you need to grab this beautiful Mesh Marble Loose Sweatshirt and Ivana High Slit Skirt duo from FaMESHed, in various colors from the beautiful Sissy of Baiastice. Oh and don’t stop there because you absolutely need this relaxed braided mesh Nanda Style from Mina, out for We ❤ Roleplay at 25% off the regular price! Thought I would take a nice long walk along the beach for these photos, a nice day to relax, ponder life and get out of my skybox all at the same time. I want to thank everyone for the amazing support that I have received over the last few weeks! I feel all warm and squishy(in a good way lol) and ready to get back to having some fun! Hope to see you all soon! Oh and these *zomg* gorgeous Europa Slingback Platform Wedges from L.Warwick are simply fabulous, there is a hud included to change the heel to a cork and a wood version love Love LOVE these to death! L.Warwick is a newer store to me but I luv them already! Using SLink’s Mid AvEnhance Feet these are something every fashionista needs in her closet…..even if it is overflowing like mine………these are a must have!